As a parent of a baby or toddler, we're always looking for the best of the products for our li'l ones. Now when I say best, that does not necessarily mean buying very expensive clothes or toys, but start with the most prime need of all - Skin Care. When they're exposed to the harsh environment after the protection they get inside the womb, baby skin needs a lot of care and protection. And if the baby has sensitive skin, prone to rashes or boils - the care that needs to be taken is a lot more. I received a really smart baby bag in my mail one day which had 4 products by MamaEarth in it - A mosquito repellant, body lotion, baby shampoo and baby oil: All in identical looking packaging of either pump bottles or squeeze bottles. 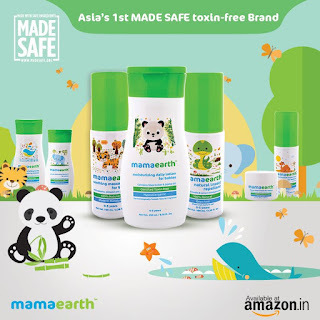 I love the name MamaEarth itself, to start with, and was excited to try these products for my li'l one. The lotion is like any other lotion in texture and application - but it does not have any fragrance to it which says a lot about it being all about natural ingredients like Shea Butter, Vitamin E and Jojoba Oil. It's priced at Rs.299 for a 200ml bottle. This one also is a squeeze out bottle like the lotion, and has a very mild coconut fragrance if you really go to smell it. It is gentle on baby's eyes and lathers and cleans the scalp well. It's priced at Rs.299 for a 200ml bottle too. It's nice to know how there are people out there who really care for getting natural products as far as possible. Godrej Goodknight also recently launched a natural insect repellent roll-on, and MamaEarth's insect repellent has similar ingredients and is DEET free. This comes in a pump-out bottle and a strong frangrance of cintronella and eucalpytus. This is priced at Rs.299 for 100ml. This, for some reason is my favourite product of the 4. I love the combination of sesame, almond and jojoba oil together and this one even has a pleasant fragrance. It's priced at Rs.299 for 100ml bottle. Overall, I am glad to have tried these products and feel so happy that a set of parents out there wanted the safest products not only for their munchkin, but for all the kiddos out there. I personally felt that the packaging could be better - the pump bottles are not very smooth and the other one did not close very nicely so that could be bit of an issue if you were travelling with the products. I really love how they've described their products etc on their website - So much love and thought put towards it all - do check their website out. They have a couple of more products under their umbrella - Sunscreen for babies (Now isn't that cool, I can't think of any other brand I have used who have a sunscreen for babies), diaper rash cream and deeply nourishing body-wash.
Their products are available on Amazon and FirstCry. The skin is the largest organ of the body and is exposed to Sun, dirt, pollution and the external environment. hese substances are meant to keep them smooth, whole, and healthy. When the areas between skin cells break down or disappear, dry skin begins to occur. The process of oily skin care treatment by using organic products may be slow but it will show off as a magic, this cause natural products works from the root of the issue & cures the issue till the tip which give you best & effective results for life time. They keep on experimenting new things and sometimes it gives them good results while sometimes it has a negative effect. The negative effect is because women use artificial methods to beautify themselves. You’ve got some interesting points in this article.